Did you ever do burpees in elementary or middle school? You put your hands down on the floor, kick your legs out behind you to get into a plank position, do a pushup, then jump your feet back to your hands and jump up to standing (or add a clap above your head). When you’re a kid, they’re pretty fun. As you get older, not so much. Well, they’re a great exercise that works your flexibility, strength, and endurance – and for that, CrossFitters love [to hate] them. 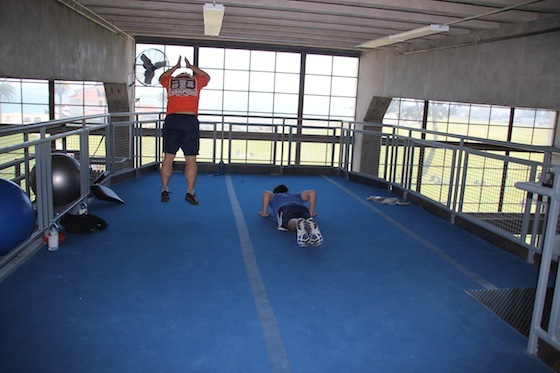 Last year, Nick and I even participated in a 100-Day Burpee Challenge. The way that works is you start out by doing one burpee on day one, two on day two, adding one every day until you’ve done 100 burpees on day 100. Sounds simple enough, right? Simple, but not easy. This challenge takes 100 days to complete, so that’s over three months you have to commit to doing burpees, every single day. If you forget to do your burpees on any given day, you make up for them the next day. That means if you forget to do your 50 burpees on day 50, you do 101 on day 51 (the 50 you forgot yesterday, plus the 51 you owe for today). Also, since the number of burpees each day are higher the further along you go, on day 50 even though you’re halfway through as far as days are concerned, you’re nowhere near doing half the burpees you’ll have done if you get through to the last day (the halfway point for the amount of burpees you’ll do is actually on day 72). How many burpees will you do in the 100-Day Burpee Challenge? A total of 5,050. Yeah, in a 100-Day Challenge, you do over 5,000 burpees (or push-ups, like the challenge I did this year). Feb. 11 (Day 73 for Push-ups, Day 1 for Burpees): I still wasn’t done with my 100-Day push-up challenge, so I had 73 push-ups to do on the first day of my 115-Day Burpee Challenge. This was also sadly the day that one of my childhood idols, Whitney Houston, passed away. We Screened a Whitney Houston Movie Marathon (42/366) in her honor that day. Feb. 15 (77 for Push-ups/5 for Burpees): Laid Down A “Sweat Angel” (46/366) – this blog entry (and Sweat Angel) came courtesy of a grueling workout, plus 77 pushups (and my 5 burpees) on this day. 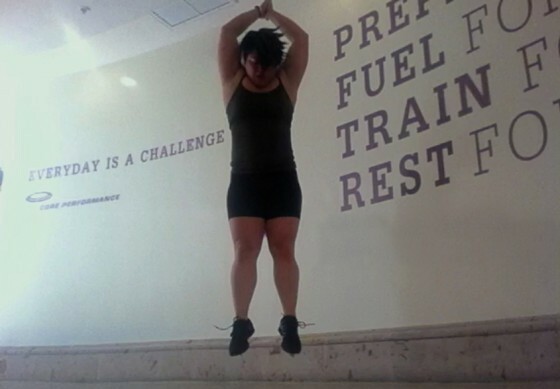 Feb. 26 (88 Push-ups/16 Burpees): Posted A Public Video Of Myself On The Internet (57/366) – The video I posted for the CrossFit Open was for “As Many Reps as Possible in 7 Minutes of Burpees,” and I did way more than my share for this event. I did the WOD three times during this weekend and did over 200 burpees. 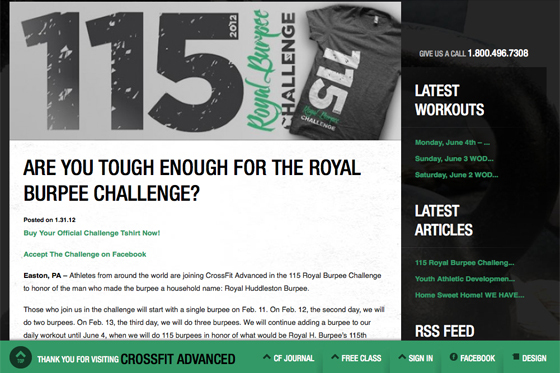 Too bad I couldn’t bank them for the Royal Burpee Challenge! Mar. 4 (95 Push-ups/23 Burpees): Been A Mo-Cap Model (64/366) – I was more than happy to do some push-ups (and burpees) for this Mo-Cap project – this was where we realized the mo-cap lost me when I got too low and when I jumped or moved quickly. Mar. 9 (100 Push-ups/28 Burpees): Completed a 100-Day Push-up Challenge (69/366) – 100 days of push-ups! Done! Ugh. Now on to more burpees. Mar. 22 (Day 41): Done a Chest to Bar Pull-up (82/366) – since I haven’t lost the weight I’ve wanted to yet, I’m positive that both my 100 days of push-ups and my 41 days (so far) of burpees have contributed to my ability to get my fat arse high enough to do these. Mar. 27-Apr. 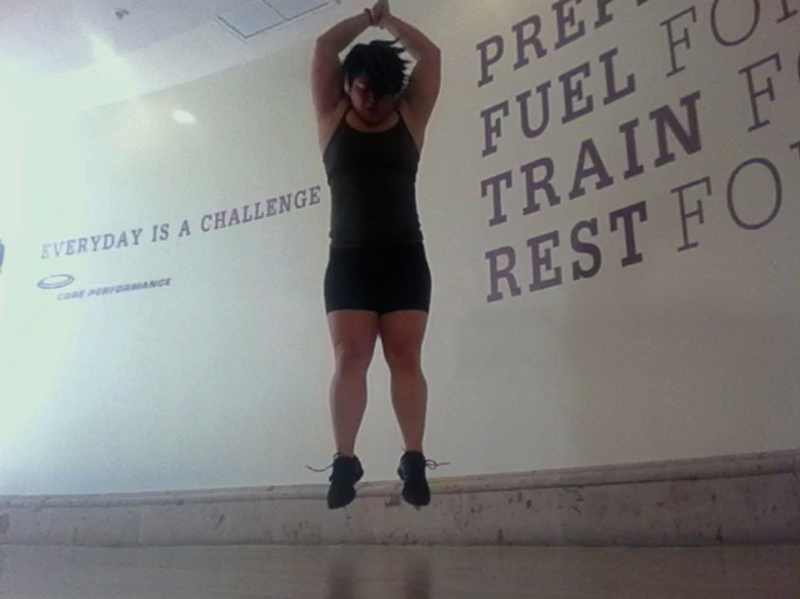 1 (Days 46-51): During my Mexico trip with the girls, I still had to do my burpees (a total of 291). April 7 (Day 57): Dined at The French Laundry (98/366) – Nick and I had a busy few days leading up to this epic event so before our 7-hour marathon meal, we did the 57 burpees for this day as well as 111 burpees that we had to make up for the two days prior (yeesh!). May 25 (Day 105): Completed a Cakepop Safari (145/366) – Even though I spent the better part of this week making cakepops for a very special birthday celebration, the burpee challenge soldiered on. There were admittedly days where I couldn’t drag myself away from the kitchen to do my burpees because I was so focused on finishing the cakepop INDT … so, right after all the cakepops were counted, packed, and picked up, I did all the burpees I had not done in the past several days. All 300+ of them. Yuck! May 27 (Day 107): Became a Member of the Golden Gate Parks Conservancy (147/366) – On this day, there was a big celebration for the Golden Gate Bridge’s 75th anniversary, as well as the Mission Street Carnaval, but we weren’t able to attend either one. On this weekend, we went up to Portland with our friend to help her with a big move. Even though we were out of town on a mission to UHaul tons of boxes back to California, I did not want to let the burpees slip, so we did our 107 in the parking lot of the awesome Premier Storage building in Portland. May 31 (Day 111): Created a Self-Hosted WordPress Blog (151/366) – Apparently, the discipline we displayed on day 107 was a fluke. Because we were driving back from Portland, we were on the road on Monday and Tuesday. Although we probably had plenty of time to do our burpees, we just didn’t get around to them (plus we weren’t exactly excited about putting on a lunatic show for truck drivers and other road trippers at rest stops). Wednesday didn’t prove fruitful either because we had a special dinner planned and ran out of time during the day to do them. We did try to do some at certain times, but we didn’t make much of a dent in the number … so on Day 111, we caught up and did a horrible 412 burpees. June 4 (Day 115): Success! Finally! Well, not without a bit more pain. Although we’d done pretty well since our burpee marathon on May 31, even though Ryan came up to visit this past weekend and we made sure to do our burpees still, we dropped the ball on Sunday. We were running around and neglected those burpees one last time. Today, we did 229. And now, we’re done. In the past 3 1/2 months, we’ve done over 6,000 burpees – 6,670 for the challenge alone, not counting additional ones in WODs. Although we did sometimes count the burpees in WODs toward our daily amount (which is allowed in the Challenge), we never banked extra burpees for future use, and never modified a workout just because it would make us do more burpees. Although it was a huge commitment when we did the 100-Day Burpee Challenge last year, and it was a huge commitment when I did my 100-Day Push-up Challenge this year, I do have to say those extra 15 days really are a mental challenge that you just don’t realize is going to be so tough, even after completing 100-Day challenges … not to mention the fact that it’s also another 1,620 burpees. But I’m very, very glad we did this challenge, and I’m today, I’m extremely glad it’s over. Happy Birthday, Mr. Royal H. Burpee. Thank you for your contribution to the fitness of people all over the world!